expand and open others. We would not have achieved success without the hard work of our (1)____________ employees, who really became part of our family. colloquially to refer to those benefits of a more discretionary nature. Often, perks are given to employees who are doing notably well and/or have seniority. Common perks are take-home vehicles, hotel stays, free refreshments, leisure activities on work time (golf, etc. ), stationary, allowances for lunch, and—when multiple choices exist—first choice of such things as job assignments and vacation scheduling. They may also be given first chance at job promotions when (18)____________ exist. 14. Belle Fourche Mayor Dave Schneider and the city of Belle Fourche are being sued by three former employees who are citing civil rights violations, age discrimination, (19)____________ and more. 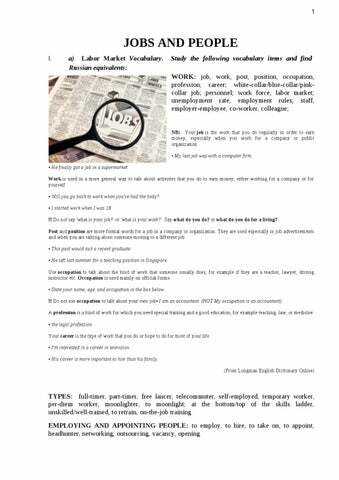 c) Make up 5 questions with the words and collocations from Topic Vocabulary and the exercise above. II. 1. BE YOUR OWN BOSS! An exciting opportunity for anyone who is willing to put in long hours, work hard, and create your own earning potential. Perfect if you like excitement, working with people and watching your money grow! 2. Very busy shop is looking for YOU! Our company is growing and looking for a bright, energetic person who likes working with people and state-of-the-art equipment in a fun environment. Good pay for the right person. 3. Have fun! Set your own hours! Work with people like yourself! Get great company perks! A fast-paced company that is as diverse as the customers it serves wants you to join its team. Training provided, full and part time available, with many positions to choose from. High school education preferred but not essential. Hiring now! 4. SERIOUS INQUIRIES ONLY…We are looking for dynamic and self-motivated individuals who are willing to learn the business, can handle a variety of tasks and who want to build a solid future and enjoy an aggressive pay plan. Call today. 5. If you are motivated by MONEY & CHALLENGE, WE WANT YOU! Our national office is seeking proven leaders who are energetic and success oriented to join our top team. If you are interested in a potential monthly commission with no cap and you have experience in sales, do not hesitate to contact us NOW! 6. Do you like to make a difference in others’ lives? Are you interested in working in an environment that promotes bringing others together? The right candidate will be able to work in a variety of settings, helping others to complete their lives. Previous experience working in a busy office, ability to work with people and alone, with a minimum of a college diploma. CONTACT OUR OFFICE FOR AN APPOINTMENT. 7. Frustrated with long hours and lack of opportunity? Progressive company seeks people oriented individuals with service industry background for career opportunity local and overseas. No experience necessary. We will train the right individuals. Travel available. CALL NOW! 8. Low pay with a real opportunity to make a difference! Work with others who are interested in saving the planet. Be part of a team who is changing the way others see and work in the world. Hiring team captains to lead our agency into the new millennium. Your chance to make a real difference! b) At the end of the auction we will go through the sheet of job descriptions and you will be told what job you have bought. These are the questions to consider: • What was it about the description of the job that made you want to buy it? • Did the job end up being what you thought it would be? III. Have you guessed right? Are there any jobs that you failed to describe? What job would you like to do? Why? What job wouldn’t you like to do? Why? With the help of the team at Fast Future Research, we have looked at potential developments in science and technology over the next 20 years and identified 20 jobs we could be doing as a result of these advances. 1. Advances in science will make it possible to create living body parts, so we could need living body part makers, body part stores and body part repair shops. 2. Advances in nanotechnology for creating molecular-scale devices and treatments could transform personal healthcare so we would need a new breed of nano medicine specialists to administer these treatments. 3. New-age farmers will grow crops and keep animals that have been genetically engineered to increase the amount of food they produce and to include proteins that are good for our health. Scientists are already working on a vaccine-carrying tomato and therapeutic milk from cows, sheep and goats. 4. We will need specialists to help manage the health and personal needs of an aging population. They will be able to use a range of new emerging medical, drug, prosthetic, mental health, natural and fitness treatments. 5. Surgeons could add extra memory to people who want to increase their memory and to help those who have been over-exposed to information and need more memory to store it. 6. As scientific advances speed up in areas like cloning, we may need a new breed of ethicist who understands the science and helps society make choices about what developments to allow. It wonâ&#x20AC;&#x2122;t be a question of can we, but should we? 7. With companies already promising space tourism, we may need space pilots and tour guides, as well as architects to design where they will live and work. Current projects at SICSA (University of Houston) include a greenhouse on Mars, lunar outposts and space exploration vehicles. 8. Vertical farms growing in skyscrapers in the middle of our cities could dramatically increase food supply by 2020. Vertical farmers will need skills in a range of scientific disciplines, engineering and commerce. 9. As the impact of climate change increases, we will need a new breed of engineer-scientists to help reduce or reverse the effects. The range of science and technologies they use could include filling the oceans with iron filings and putting up giant umbrellas to deflect the sun's rays. 10. If a deadly virus starts spreading rapidly, few countries, and few people, will be prepared. Nurses will be in short supply. And as death rates rise, and neighborhoods are shut down, someone will have to guard the gates. 11. The act of stealing clouds to create rain is already happening in some parts of the world and is altering weather patterns thousands of miles away. Weather modification police would need to control and monitor who is allowed to shoot rockets containing silver iodine into the air - a way to provoke rainfall from passing clouds. 12. As more and more of our daily life goes online, we will need specialist lawyers to resolve legal disputes which could involve people living in countries and regions with different laws. 13. Intelligent avatars or computer characters could be used to support or even replace teachers in the classroom. The devotee is the human that makes sure the avatar and the student are properly matched. 14. We need the designers and builders of the next generations of vehicle transport using alternative materials and fuels. Could the dream of zero-emission cars or even underwater and flying cars become a reality within the next two decades? 15. As content on the television, radio and the internet becomes increasingly personalised, there will be jobs for specialists working with producers and advertisers to create news, entertainment and information tailored to our personal interests. While some personalisation will be done by computers, customised narrowcasting to individuals could be performed by humans. 16. As data and information about us increases on computers everywhere, we may need waste data handlers to securely get rid of our data so we canâ&#x20AC;&#x2122;t be tracked or have our identity stolen. 17. Clutter managers will help us organise our electronic lives. They would look after our email, make sure our data is stored properly and manage our electronic passwords and profiles. 18. Time has always been precious and time banking already exists. In the future there may be other alternative currencies that will have their own markets where they can be traded. 19. We may need social workers for people who may be traumatised or marginalised by social networking. 20. This job would be an extension of the role played by celebrity stylists and publicists. Personal branders will work for anyone to create a personal "brand" using social networking sites and other media. The sort of issues they would be dealing with will be what personality are you projecting via your Blog, Twitter, etc? What personal values do you want to build into your image? And is your image consistent with your real life personality and your goals? c) Invent a job of the future that is not mentioned in the text. Think of the name for it and describe what a person in this job might be doing. V.
Every person has different reasons for working. The reasons for working are as individual as the person. But, we all work because we obtain something that we need from work. Make a list of 5 reasons why people work. Rank them from the most important to the least important. Explain why, in your opinion, some reasons are more important than others? Read the article and do the following assignments: a) Some sentences are missing. Find where they belong by matching numbers with letters. SOMETHING had to change. Working alone at home as a freelance writer, which many people dream of, wasn’t working for me. [A] I needed a steady, secure, part-time job, something I could leave behind at day’s end, with lots of people contact. I craved a new challenge, a chance to learn and perfect some fresh, useful skills. I applied for a job as a part-time retail sales associate selling a popular and well-known clothing brand in an affluent New York suburb. I would earn less than $12 an hour, no commission. [B] Eighteen months later, I’m still there, working six to eight hours a week. When friends, family members and colleagues learned of my new job, some were puzzled, some supportive. Many wondered: Wouldn’t I be bored? Could I handle it? My last full-time job was as a reporter for a major daily newspaper, but I’d given up sending out résumés. Two of my bosses had since been laid off, and in the last year, thousands of journalism professionals have lost their jobs — hundreds of them in New York, where I live. Today, with any reliable job a precious commodity, I still show up every Tuesday at the store, even as I continue to freelance most of the time. [C] I am 20 to 30 years older than most of my colleagues, twice the age of my assistant manager and more than a decade older than my manager. [D] In one world, I interview C.E.O.’s, write articles for national publications and promote my nonfiction book. In the other, I clock in, sweep floors, endlessly fold sweaters and sort rows of jackets into size order. Toggling between the working class and the chattering class has taught me a lot about both: what we expect of ourselves, how others perceive us, ideas about our next professional step and how we’ll make it. The contrasts between my former full-time job and my current part-time one have been striking. I slip from a life of shared intellectual references and friends with Ivy graduate degrees into a land of workers who are often invisible and deemed low-status. In journalism, my workplaces often felt like rooms filled with balloons, enormous and fragile egos rubbing and squeaking up against one another until, inevitably, several burst with a bang. [E] In journalism, I’ve had managers who routinely shrieked abuse. In retail, I’m managed by a man who served in the United States Air Force in Mogadishu and who wears his authority comfortably and rarely raises his voice. Even the most senior regional and national managers in my company who visit a few times a year know my name, say hello and listen to sales associates with respect. [F] In journalism, all too often perception helps people get ahead. One editor’s star performer is another’s nightmare. In retail, numbers win. I’ve become one of my store’s top salespeople, and, for the first time in 30 years of professional life, I know my clear value to my employer. Our individual sales are posted on a wall for everyone to see. [G] Social capital means nothing here. Our retail sales floor is the levelest playing field I’ve yet seen. [H] I enjoy this job, grateful to the company that took a chance on me. But I can’t afford to do it full time. Only using my other skills the rest of the week allows me to meet my financial commitments and keep saving for retirement. [I] It’s not scraping gum and food off the floor or standing for five straight hours. It’s not refolding clothing so many times the skin on my hands cracks from dehydration. It’s some customers’ stunning sense of entitlement, even contempt, for those — i.e., us — they feel certain are their inferiors. Expecting good service is fair. Treating hourly wage workers like personal servants is not. When you wear a plastic name badge, few bother to read it. We, too, are intelligent and proud of our skills; many of us are college educated. Some of us travel often and widely, speaking foreign languages fluently. Our employees include nationally ranked athletes, a former professional ballet dancer and a former officer in the French Foreign Legion. Fortunately, just enough of our customers are pleasant and easily accommodated. They include jet pilots and surgeons, high school students and sanitation workers, and I enjoy their stories, whether of open-heart surgery or their Costa Rican honeymoon. I love sharing my expertise and experiences. When customers tell me they’re going to Fiji, Kenya, the Grand Canyon or Cuzco, Peru, I can offer first-hand advice from my own trips there. I know what they need to stay warm, dry and comfortable on the ski slope, boat deck, hiking or bike trail. [J] Some are college students, some already work at two other jobs, and for top managers, it’s a well-paid full-time career. It offers flexible scheduling, can be a lot of fun and — in an economy forcing millions to redefine themselves professionally — its expectations are manageable and clear. With so many media companies struggling, hundreds of my peers are losing their handsome titles and well-paid jobs. Some of them, too, may have to redefine themselves, temporarily and part time, or permanently. Right now, at our store and for this company, I play on a winning team. It feels good. “Are you still there?” my friends ask me, month after month. Luckily, I am. 1. Sometimes I feel like Alice slipping through the looking glass, toggling between worlds. 2. My retail co-workers have chosen this job for many reasons. 3. In retail, divas are fired or soon quit. 4. To my surprise, I was hired, even though I had zero retail experience. 5. The relentless isolation of connecting primarily with others online and by telephone was killing me. 6. I like that clarity. 7. The hardest part? 8. I am now a battered veteran of two holiday seasons. 9. I never expected that. 10. It comes at a price. Why did Caitlin decide to find a part-time job? Why were some of her friends and relatives not quite sure that her part-time job was good for her? What does she do as a free lancer? What does she do as a part-timer? What are the differences between her current part-time and her former full-time jobs? What, in her opinion, is the most humiliating about her part-time job? What does she like about her part-time job? c) You are offered several jobs: full-time, telecommuting, part-time, free lancing. Talk about advantages and disadvantages of each job and tell which you would choose and why. NOTE: In the exercise all the verbs are in the Infinitive while in the article they are not. why. The disturbing answer: Work becomes a substitute for greater meaning in their lives. "I had a guy come to me and say, 'I've got $40 million. Do you think it's enough?' " White recalls. "He meant, Was it enough to be happy and safe? The correct answer is no. You won't find [those things] with $4 billion. You're looking for 'enough' in the wrong place." Even old Emerson would buy that. What, in your opinion, do Ralph Waldo Emerson’s words mean? What animal is he compared with? Why? Why are motivations of workaholic executives called messy? What could be the examples of ‘toys’ mentioned in the article? What are the reasons why workaholic executives keep working? What does the phrase ‘They probably want to burn their passports’ mean? According to the article, is it true that the more money you have the happier you are? Why or why not? Why does it seem easier for female executives to leave their jobs? According to the article, what is the difference between ‘volunteer’ and ‘prisoner’? According to the article, how much money is enough to feel happy and safe? c) Ask three people you know about the reasons why they work. Report what you have found to the class. This is Unit 6 of textbook on reading and speaking for English majors that I am currently working at.